Throughout the event there are challenges, puzzles, quests and riddles which test the attendees, giving them an opportunity to learn new skills, further develop existing ones and to push themselves in a safe and secure environment. The highlight is always the finale, the crescendo where all the efforts of every team are brought to bear in a co-operative final fight to round off the storyline and bring the event to a close. Putting the event into an alternate reality with a well-grounded storyline is an exceptionally clever way of giving more strength to the learning opportunities. Attendees are able to temporarily put everyday stresses to one side and can easily become encapsulated in the environment and story that is being played out in front of them, with themselves being very much a part of that story. 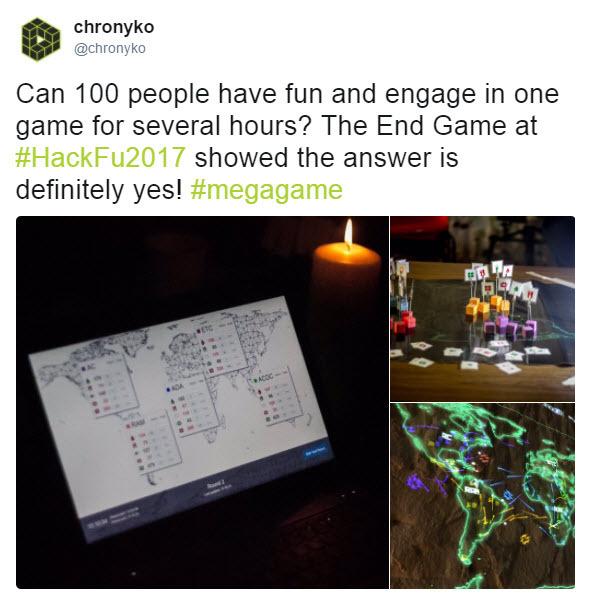 This years event had me thinking that what we’re actually doing at HackFu is providing a safe and secure environment in which the attendees can play, and in doing that they’re learning. As young children in nursery or primary school, we’re encouraged to play, as this how our young brains learn new skills. As we grow and move into careers the very idea that we might “play” to learn seems very childish and certainly not business like, or indeed serious, for our “serious business work” (air quotes definitely required). From large corporate companies to small start-ups, they all adopt the standard way of learning new skills; in a classroom led environment, because as we grow our learning switches from nursery style play to secondary school type classrooms where learning is anything but fun. Through HackFu I have found that play-led learning is the best solution to ensure learning new skills is easy because adding the story line to the event, adding the ability for attendees to immerse themselves into the alternate reality, helps provide a much stronger purpose for learning, other than for learnings’ sake. As a software developer the easiest way to learn a new language is to learn it for a purpose, be that a new web-app, a new micro service or a new desktop application. This is where the difference between structured play and unstructured play comes in. Structured play, or “play with purpose”, is goal orientated play where there is a purpose or a new skill to be learnt from the play session. Learning a new development language would fall under structured play. The opposite, being unstructured play, is play with no objective and no rules. You would think that for companies to begin to accept play as a tool for learning then that play session would need to be structured, else how do you define whether the learning has been successful; how do you measure success? Is it the adoption of a new skill set, or an expanded range of projects onto which someone can be assigned? For me, one of the best parts of HackFu, and of the whole “play as learning” ethos is actually the use of unstructured play. By removing the need to define success in such precise terms HackFu actually provides the attendees with a greater ability to learn the skills they actually want to learn, and by placing them in a believable and immersive environment it reinforces the drive and desire to learn. Therefore the definition of success in an unstructured play setting is a happy employee, in a company where, due to the happiness through continued learning and development, the staff turnover is low. I’ve been thinking about the quotes that I’ve dotted above this article, for a few days now, wondering how I could use them to really drive home the message I wanted to convey in this post. All the quotes are about how children learn, but do we really stop learning through play just because we are no longer regarded as children? 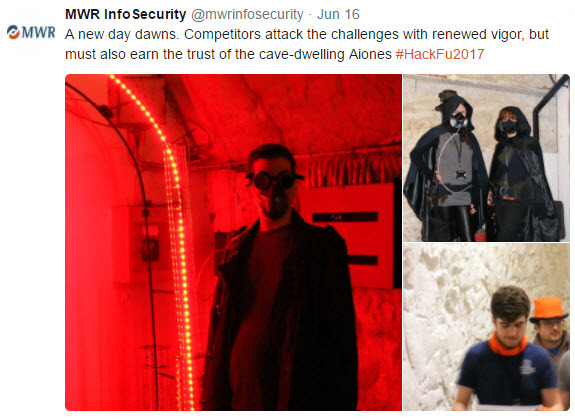 I believe events like HackFu and the work done by MWR and by chronyko, where play through puzzle solving is a core element of their approach, show this to be untrue. Put adults into a scenario where they can play, and the potential for learning is increased, we just never regard it as play.